THERE are two types of telescope mounts: Equatorial and Alt-Azimuth. Both are designed to keep a celestial object in view to counteract the Earth's west to east rotation. Both mounts can be obtained commercially to have small motors to auto- track a star, moon, planet or a galaxy for hours at a time. Without this set-up, the image will 'drift' out of sight, causing the user to manually move the telescope every few seconds by hand. While this was the case many years ago, thanks to the digital age, most amateur telescopes now come with all this as standard, making it even easier to enjoy the delights of stargazing. Equatorial mounts have a set of steel weights at an axle called the Declination Axis (DA) to balance the weight of the telescope at the other end, and another axis called the Polar Axis (PA). While the DA can move to a target north or south of the equator, the PA is the movement of the star in an east-west direction. The PA has to be tilted up to suit the user's latitude and its base set at 169degrees in Azimuth, which is true go-south. Once the mount is set with precision, the telescope will not only track that target for any length of time, the user can plug in a DSLR or CCD camera to take long exposures of the same. We'll be covering astrophotography in an upcoming column. The other type is the Altitude-Azimuth (or Alt-Az) which does not need to be set up as precisely as an Equatorial. The Alt-Az mount has the telescope tube sitting on two non-friction bearings that allow the telescope to move up and down (altitude) and the mount's base can swivel 360degrees in Azimuth. 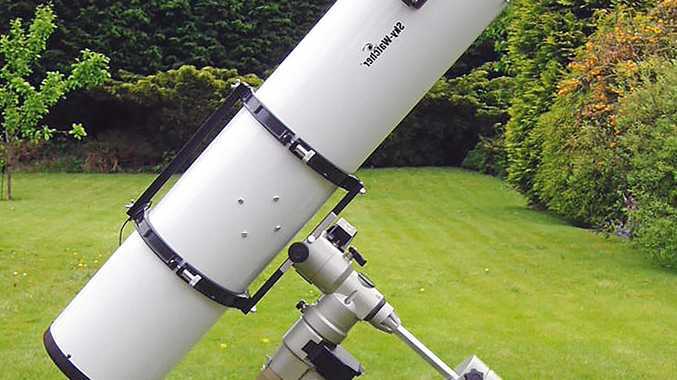 This simple mount can be found in two types: the Dobsonian, or Dob for short, is named after the late American amateur telescope maker John Dobson, who in the 1970s made a simple up- down and swivel mount to allow the user to manually move to a target and view it with ease. The other type is the Alt-Az forks that have the telescope pivoting in its centre inside a set of forks that allow the scope to move up-down and turn in any direction on its base. These days, 99per cent of all Alt-Az mounts sold commercially come with a set of small 12v DC motors to slew (GOTO) the telescope in both axis to its target and track the same for long periods of time. While these mounts are simple to use, they're not as suitable for astro imaging with a camera as the Equatorial is, unless of course the forks are angled to suit the user's latitude and pointed at 169degrees in Azimuth. If you have an astronomical-related question or want to book a stargazing night at the Observatory, email mao123@bigpond.com or phone James on 0427 961 391. Visit kingaroyobservatory.com.